Actril Cold Sterilant, already used in clean rooms for 20 years, is now even easier to use in these critical environments. 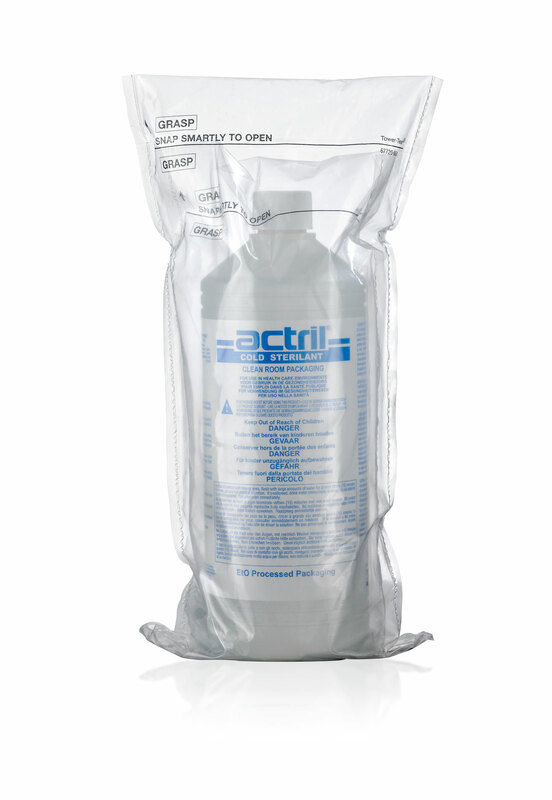 Actril Cold Sterilant has been optimized for the clean room environment by packaging it to bring straight into the clean room suite. No longer does the product need to be cleaned and wiped down to bring it into these critical environments. Because of the unique method of disinfection, Actril does not have to be part of a rotation of disinfectants program. Each case of Actril includes 6 x 0.96 liters & 6 sprayers per case. Each bottle and sprayer are wiped down with alcohol and clean room wipers, double bagged in a controlled environment and EtO processed. Validation testing supports a 106 sporicidal reduction of contamination. Specifically, three validation half cycles confirmed complete kill on the recommended external and internal Biological Indicators (BI) (106 B. atrophaeus) following EtO exposure. (Testing was done in accordance to the ANSI/AAMI/ISO 11135:2007.) EtO residual levels conform to ISO 10993-7. Average Log Reduction from "Actril Cold Sterilant Research Report: Surface Challenge Test (USP <1072>)"